When we went to Aruba in November, we knew ahead of time that we were going to go Jeeping. Still, we waited until the last minute to reserve our Jeep. 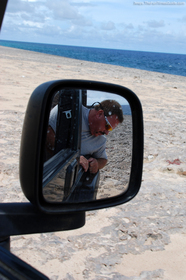 As a result, we got what must have been THE last Jeep left to be rented on the island that day! The lesson: don’t wait til the day before to rent your Jeep. Book it a couple days early. Make your reservations through the concierge at your hotel or phone the major Jeep rental companies (like Hertz, Budget, etc) directly. 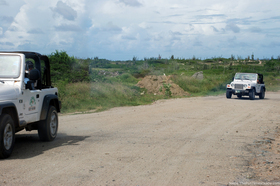 Jeep rentals in Aruba are reasonable: $50 to $60 for the full day (non-4WD vehicles are much cheaper for the day). 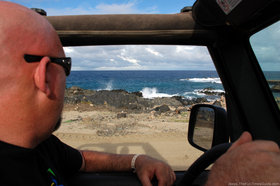 Read: The pros & cons of a Jeep rental vs a Taxi ride in Aruba. The island is only 19 miles long and 6 miles wide, so as long as you start early in the morning, you’re likely to get all of the major sights in. It’s a great way to spend a day in Aruba! 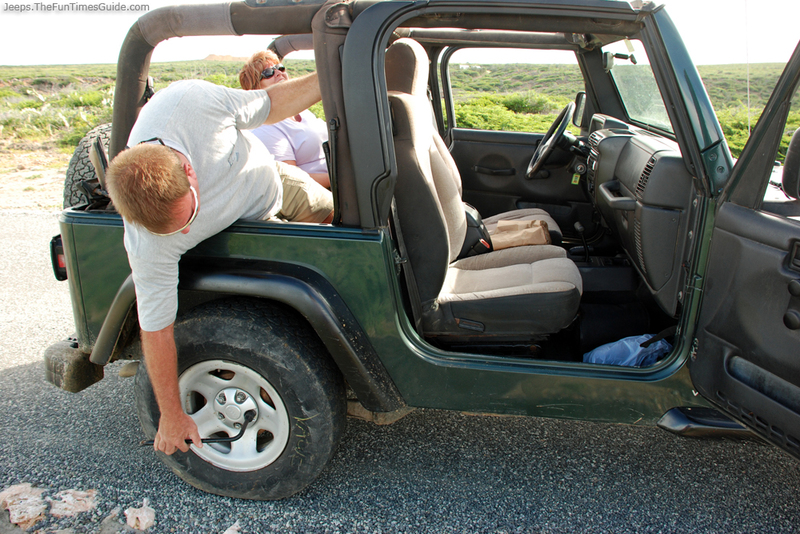 Since our day of Jeeping was planned at the last-minute, we were disappointed to learn that all Jeeps were sold out on the morning we wanted to drive around and explore the island of Aruba. Our only option was to ask the front desk clerk (they were always so willing to help at the RUI Palace, nice people). Unfortunately, the one they found “sounded” fine, but when we saw it in person, we could hardly believe our eyes. The interior had all been stripped out and shoddily replaced. Thank goodness we didn’t want to use the soft top, because it was whopper-jawed and the soft top frame looked bent. We’re not picky about Jeeps, trust me. We’ve been in our share of beat up Jeeps and had a grand ‘ol time. In this case, it wasn’t the “look” of the Jeep… it was the fact that this Jeep Wrangler 4WD sounded like it was on its last legs. On every little bump, it felt like the bottom was going to fall out from under us. And it didn’t shift gears very well either. But the worst part: the tires! Three of the 4 tires had yellow marker circles pin-pointing where holes had been fixed before. A few of these were in the sidewalls! Well, after a couple miles of moseying down the paved road, we decided we’d play it more cautious than normal and try not to go offroad if we didn’t have to. TIP: If you’re renting a vehicle, be sure to familiarize yourself with the local traffic signs. We were clueless about what the signs meant. But, for the most part, speed limits are not obeyed. We saw some rather crazy passing strategies on our trip! Know how to change a tire! 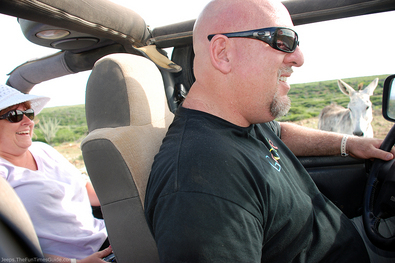 In Aruba, you never know what you’re going to get, Jeepwise. 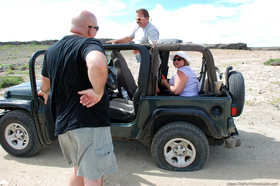 We saw a number of other tourists in rented Jeeps as well. 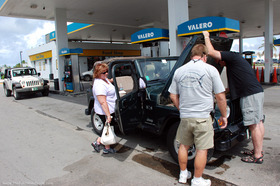 And the Jeeps ran the gamut from “nice and clean” Jeeps to beat up ones like our rented Jeep was. Unfortunately, ours got a flat tire halfway into the day. Yes, the yellow markings on the tires’ sidewalls should’ve been a clue. But Jim and Terry ended up wasting a good deal of time trying to make the beat up old lug wrench work properly since it was “stripped” from having been used so much! And we’re obviously not the only ones who got a flat tire out there in the Caribbean desert… there were lots of tire remains spotted on the beaches and on the sides of the roads. 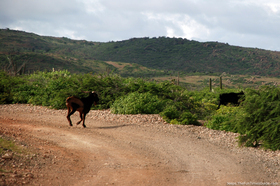 One of the highlights of our Caribbean Desert adventure was driving past so many free-roaming wildlife. There were sheep of all colors, shapes, sizes, and types. Plus lizards or iguanas — from small to large and brightly colored. And then there were these 2 donkeys. They came right up to our Jeep. 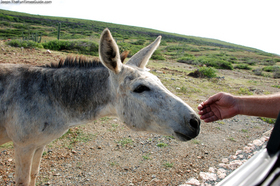 About the moment that one of the donkeys got close enough to the Jeep for Terry to start petting it, images of “wildlife adventures gone bad” suddenly flashed through my mind. Another highlight on our Jeep ride: all of the cool rock formations! From the “natural bridges” created by waves beating on rocks to all these man-made rock statues. They were incredibly similar to the Inukshuk stone shapes that we saw in Canada. 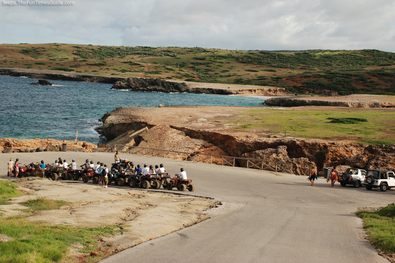 But in Aruba, these miniature stone statues are everywhere you look near the Bushiribana Ruïnes and The Natural Bridge. Word is, you’re supposed to make your own little rock formation there, and if it’s still standing naturally on its own when you return, then you’re destined to have good luck. In person, it’s such an amazing sight to see, because there are literally thousands… if not millions of these manmade rock statues placed next to nature’s own rock formations! Ages ago, most of Aruba was submerged under water. Eventually, “natural bridges” were carved out of rock and coral by the continuous pounding of the sea. 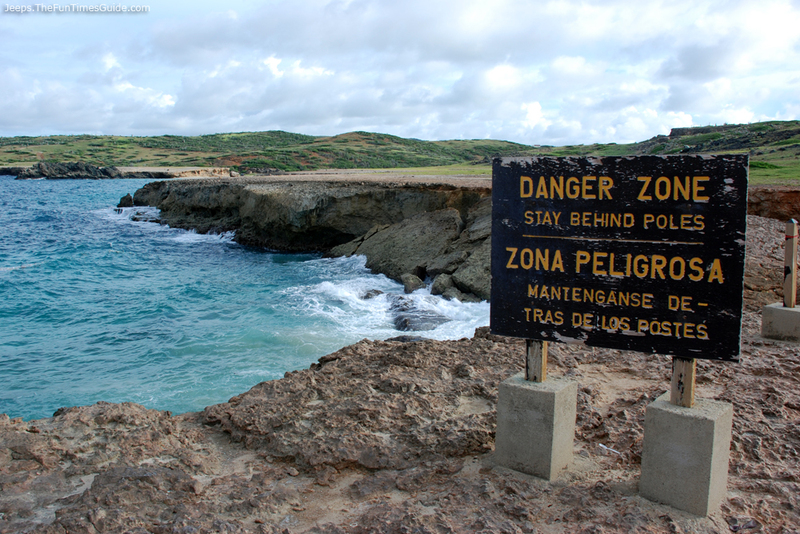 Today, there are 7 natural bridge-like structures in Aruba. 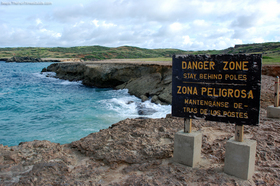 The most popular, The Natural Bridge was the longest in the Caribbean (100-feet long and 24-feet high) until it collapsed in 2005. When you see it in person, it’s still a remarkable site. Actually, the entire island has rocky features like this — it’s so cool. In fact, it’s the rocky coral that most likely busted the tire on our Jeep. You see, we ventured offroad a bit to this one spot along the beach (that was a million miles long) and there was no way you could even think about walking barefoot along these parts. The “beach” was harded coral that had formed along the beachside through the years. It had sharp pointy parts from all angles — similar to coral or sponge that you might find in the ocean. That is probably what pierced the sidewall of our tire! Caves And Flashlights And Bats, Oh My! 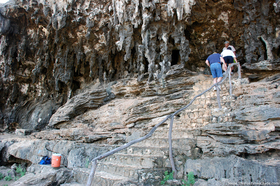 We also visited some of the caves found on the island of Aruba. There are Indian rock drawings found on the cave walls inside, and tour guides with flashlights help to light your way and explain some of the cave’s natural formations. Bats live up high in the cave’s crevices. Many of the caves were closed to the public when we were there because vandals had written grafitti on some of the cave walls. Worse yet, the vandals shined bright-beam flashlights at many of the bats which confuses the adult bats and causes them to flee. The babies left behind had starved and died. So, in order to help restore the bats’ natural habitat, they temporarily closed off several caves until things got back to normal.